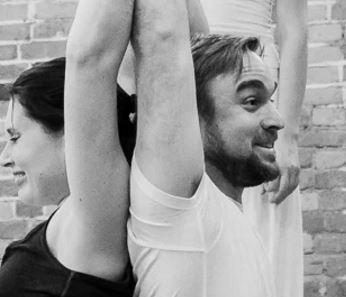 Mark walking his talk — back to back in an embodied yoga principles course. Are less-embodied movement practices good gateways into a deeper practice, or are they doing more harm than good? Are all movement practices really created equal, or are some better than others? Is what you're doing working? How do you know? What matters about a yoga posture? Should you practice yin yoga or weightlifting or contact improv or ... ? Just a few of the deep questions, of many gems, from the chat with this show's guest, Mark Walsh. Mark is an embodiment facilitator who's worked in war zones, in board rooms and yoga studios. And he is, I think, a sharp sword who is doing some really good work in hacking away old, stagnant beliefs from their roots. It's about being in the world — political, if you will — and not about isolating "the body" from our lived experienced, which very much includes one another. Thanks, Mark. Hope you enjoy, y'all. Listen above, on your fave podcast app like iTunes, or download this episode here. Here's the Embodied Yoga Principles video playlist on YouTube. Mark's e-book Centring: Why Mindfulness Alone Isn't Enough.